At first glance, Flow's UI looks very similar to that of Linea Sketch, The Iconfactory's excellent sketching app. Your canvas fills the screen, overlayed with the toolbar at the top of the screen, your Pen Dock on the right, and the Pen Editor on the left. Even though this is already a fairly minimalist setup, if you want all tools out of sight entirely, there's a button in the toolbar that hides everything immediately. For anyone familiar with Moleskine’s other apps, Timepage and Actions, the same sense of design flair and attention to detail found in those apps is present in Flow. The app is beautiful to look at, it takes great advantage of features like drag and drop, and it's full of playful flourishes that bring delight in everyday use – like the way a trash can icon appears when you start dragging a pen, then pops its lid open when you move the pen over it. One of Flow’s core strengths is its simple and accessible set of tools and options. Unlike many other digital notebooks and sketching apps, I had no trouble in Flow discovering how to select or modify tools, paper, or any of the app’s other settings. Moleskine’s team did a great job with balance: providing the options users want while being careful not to clutter the app with too many choices. Flow offers six different types of tools: pen, pencil, marker, highlighter, brush, and fountain pen. Each of these can be used in a variety of colors and sizes; tapping a tool in the Pen Dock will show you its details in the Pen Editor, where color and size adjustments can be made. Paper settings are found via the grid icon in the toolbar. You can choose from six different shades of background color for your canvas, all of which look excellent, and also toggle between plain, dotted, squared, or ruled paper layouts. One detail I love about Flow is that it enables customizing your Pen Dock so that it holds only the tools you want, in the colors and sizes you want. If there's a particular tool you use a lot, you can add multiple iterations of that single tool to the Pen Dock, all with the color and size settings you prefer. And if there are tools you never use, you can easily remove them from the Pen Dock so that only the tools you care about are present. All of this helps bring the app closer to an analog notebook experience. This level of customization helps truly make the app your own. Rather than having to learn how the app works, you can make it work in the way that feels most natural to you. 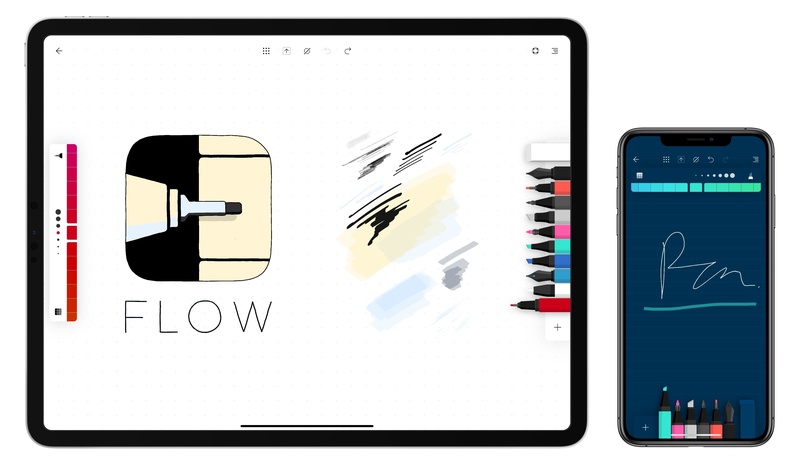 Flow was designed first and foremost as an iPad app, and it shines on that platform thanks to support for all iPad sizes, custom Apple Pencil gestures, drag and drop, and Split View. The app also lives on the iPhone though, where your documents will sync if you set up a free Moleskine account. On iPhone in portrait orientation the layout is rearranged a bit, with the Pen Dock at the bottom of the screen and Pen Editor at the top – this setup works fine, but what's even better is if you turn your iPhone on its side to view Flow in landscape, where its UI models the iPad. 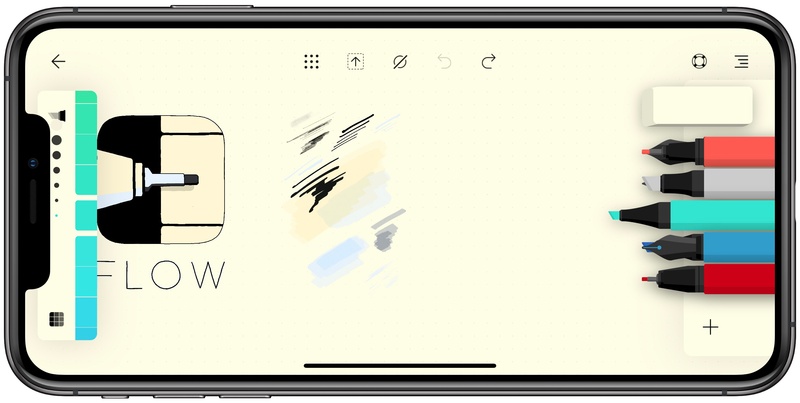 One detail that makes Flow work well on both iPhone and iPad is that its documents are horizontally infinite, but not vertically so – meaning you can stretch the canvas's width as far as you want, but its height is fixed. This limitation could serve as a negative in some cases, but it also operates as a positive when it comes to working on the iPhone. Since your documents all have a fixed height, that height by default is displayed in full inside the iPhone app, both in portrait and landscape views. As a result, there's far less need to pan around the iPhone's smaller display to see things created on your iPad; you'll still have to do that for anything that's horizontally off-screen, but even then you never feel lost like you might have with a document that stretched out in multiple directions. 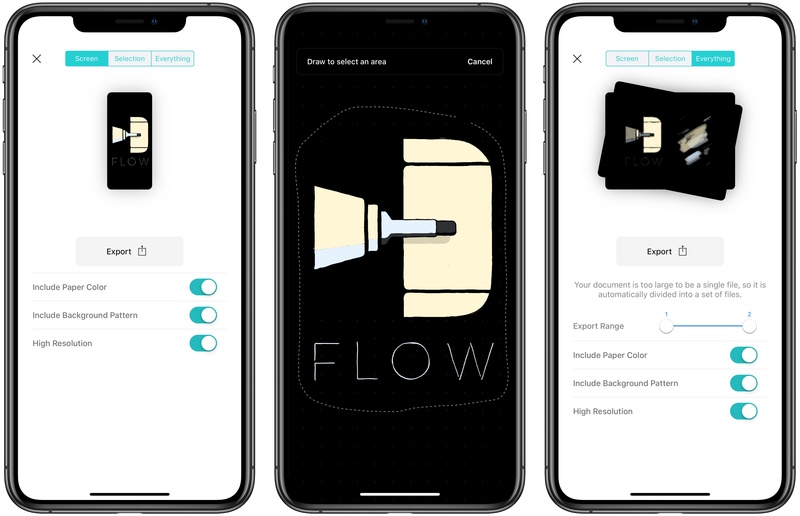 In the end, the iPhone version of Flow is far more convenient and usable because of this design decision, though understandably some users might have preferred the option for a truly infinite canvas. The last Flow feature that deserves mentioning is its export mode. Tapping the export button in the toolbar offers three thoughtful options: you can share just the portion of your document that's currently on-screen, or a selection that you make with a lasso tool, or the entire document. There are also toggles available to include or exclude the paper color and background pattern, as well as export in high or low resolution. As you make changes, the preview in the export screen changes, and you can either use drag and drop to share that previewed image with another app, or tap the Export button to open the share sheet. Flow includes everything I could want from a modern digital notebook. It offers the right set of tools and paper settings, and the customization options to make those things my own; it's beautifully designed and includes several delight-inducing interactions; finally, it works great on both iPad and iPhone and supports all the modern technologies I could ask for. 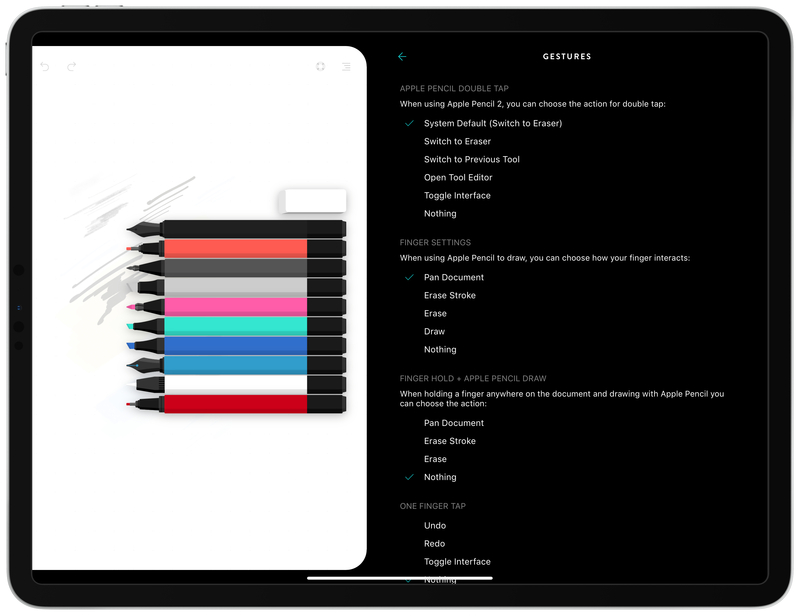 If you're interested in a new digital notebook, Flow is an impressively made, high quality app that's quickly become my favorite in this category. 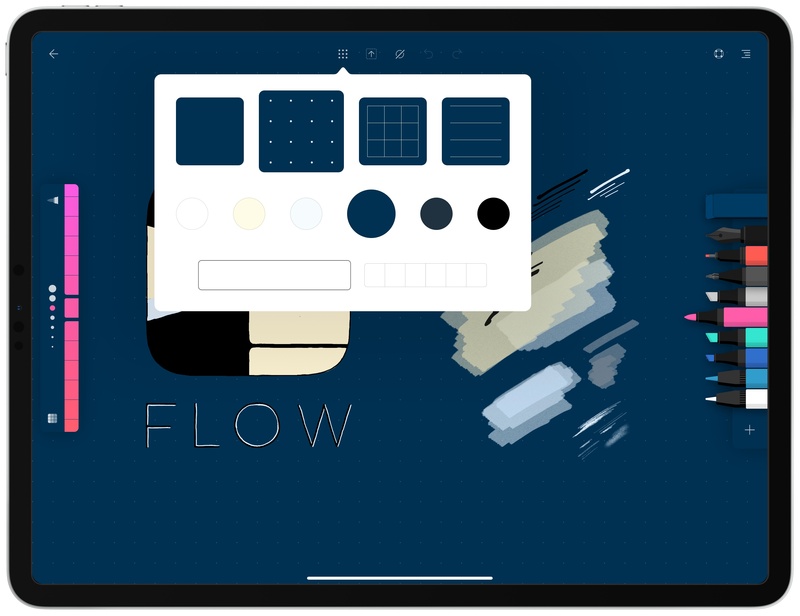 Flow is a free download on the App Store, and offers a 1-week trial to test its full feature set, but after that week a subscription is required for ongoing use; you can subscribe for $4.99/month or $29.99/year. The monthly plan is a nice option to have for short-term use, but if you decide to go all-in on the app post-trial, the annual plan is a much better deal, with savings of 50% for an average monthly cost of $2.50.